Hi [INSERT YOUR FRIEND'S NAME HERE], Please check this out https://www.proactivehealthcare.co.uk/gut-health/critical-digestion-by-enzyme-science?referrer=0 and get £4 off your first order (minimum order £30 excl. shipping). Thanks! Enzymes are the most effective tools made by the body to aid digestion and metabolism. They turn the food we eat into energy (ATP) and unlock the energy for use in the body. A tremendous amount of energy is required to produce the metabolic, biochemical and digestive enzymes necessary for health and maintenance. When we fail to properly break down foods, the digestive process is disrupted. When there is an insufficient quantity of digestive enzymes present in the body, undigested food may pass into the large intestine and be acted upon by intestinal flora. The resulting reaction produces gas and discomfort. Enzyme supplementation encourages healthy digestion of proteins, fats, fibers and carbohydrates, in addition to promoting an optimally functional GI tract. Providing the body with a sufficient supply of enzymes decreases the amount of energy required to complete the digestive process. Enzymes provide therapeutic benefits beyond the GI tract by increasing physical vitality and general wellbeing. Probiotics support regularity, aid the immune system, product digestive enzymes and manufacture essential vitamins B and K. When we consume probiotics, we promote an environment where beneficial microflora thrive. Critical Digestion contains one billion active probiotic cultures in each capsule. Guaranteed potency at room temperature, the probiotics in Critical Digestion fuel the digestive process to produce additional lactase, protease and amylase enzymes to the lower GI tract. 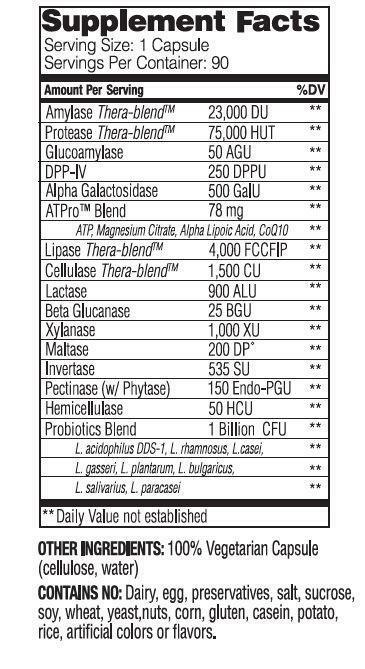 The enzymes offer synergistic benefits to the full spectrum formula, supporting optimal digestive health. Adenosine triphosphate (ATP) produced in every cell, is found in all raw foods and is the body?s natural source of energy. Supplementing with ATP complements a healthy diet by increasing the energy potential of foods consumed. It is a primary signaling molecule for healthy cellular processes. One such process is the necessary production of Hydrochloric Acid (HCl) in the stomach, which supports protein digestion. ATP is also instrumental for the cells to benefit from the nutrition found in food. Without ATP no nutrients would be able to pass through the stomach?s membrane. Stressors like age and exercise can diminish ATP levels. Supplementing with ATP and nutraceuticals that support ATP production may complement the body?s natural energy production. Supplementation may also decrease the energy demand of the digestive process, support nutrient absorption and improve HCl availability in the upper GI. Take 1 capsule per meal with the first bite of food. More may be taken as recommended by your healthcare practitioner.